TK Smith pickups could very well help make your 2018 guitar sound like a sizzling 1958 jazz/rockabilly/blues machine. Although Yucca Valley, California, is just three hours east of L.A., it might as well be a world away. In fact, you could say It’s A Mad, Mad, Mad, Mad World away, since the town provided some of the striking desert scenery in Stanley Kramer’s classic 1963 comedy. Sadly, a lot of the wide-open spaces in the film have been replaced by Walmarts and Starbucks. But Yucca Valley, bordering Joshua Tree National Park, is still slow paced enough to recall a simpler time. In that sense, it’s the perfect setting for TK Smith Electronic Guitar Service. That’s where TK Smith produces — by hand — his midcentury-modern Paul Bigsby–inspired Smith Special guitars; axes that would’ve looked right at home in the hands of Grady Martin or Merle Travis. While Smith’s guitars come with the sort of price tags you’d expect from high-end, handmade custom axes, his pickups cost about the same as everyone else’s — and they could very well help make your 2018 guitar sound like a sizzling 1958 jazz/rockabilly/blues machine. C.A.R. (medium output), from $320: The Cast Aluminum Replica is just right for traditional jazz, swing, rockabilly, Travis picking or blues. Use it in the bridge if you want the “Grady Martin sound”; use it in the neck for jazz, swing and blues. It’s got a distinct hollow, wooden tone that floats very nicely on top of an ace rhythm section. 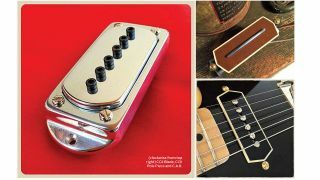 CCII BLADE (medium vintage output), $159: The CCll Blade has a big, even, woody tone that’s well balanced for most guitars. Low-mids are accentuated and top end is naturally compressed, giving it a slightly rolled-off but clear voice. It’s responsive and dynamic at low volumes for jazz, Western swing and vintage jazz yet excels harmonically when pushed with harder picking dynamics or driving an amp into greasy overdrive. CCII POLE PIECE (medium vintage output), $159: This version has the same dynamic range, responsiveness and punch as the Blade, but the high mids and top end are more pronounced. There’s more natural growl and bite while maintaining the CCll tonal palette. It’s a great alternative for players who find the CCll a little too mellow. SUMMERTONE (medium to vintage output), $195: The SummerTone is a direct replacement for a dog-ear P-90 and offers woody, articulate, big, clear tones. It shares tonal characteristics with the CC II and C.A.R. but leans closer to the C.A.R. in terms of voicing. Check out tksmith.net for more info.